SKU: Q8. Categories: Deck Finishes, Exterior Finishes, Wood Preservatives. Tags: cedar finish, deep penetrating wood finish, exterior wood finish, log oil, outlast, outlast Q8 Log oil, Q8, Q8 Log oil, wood finish, wood preservative. 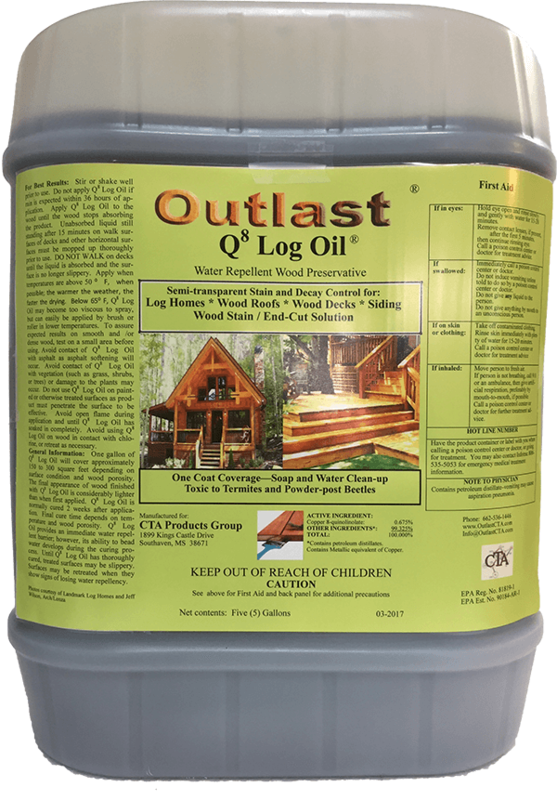 Outlast® Q8 Log Oil® is a one-step product for all your log home needs. One-coat application saves you time and money. 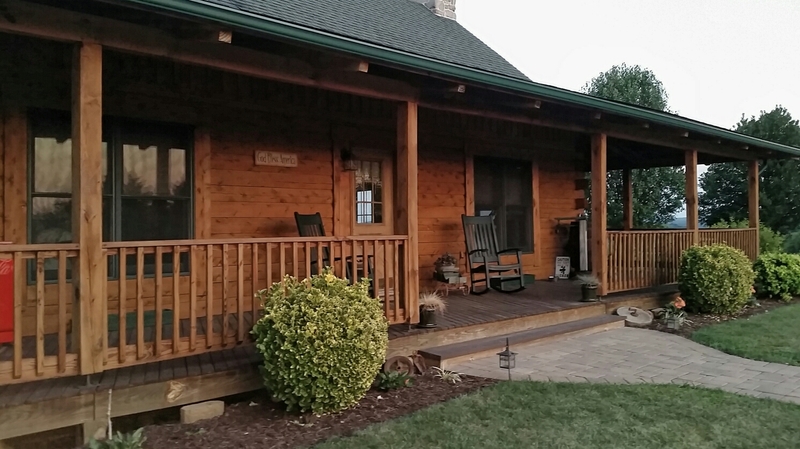 Using Oxine Copper (copper-8-quinolinolate) Q8 Log Oil penetrates deep into the wood, and will never crack or peel, meaning less maintenance and more time enjoying your log home. Great for application on logs, siding, decking and cedar shakes. Excellent product for protecting end cuts of pressure treated wood. Always apply one saturating coat. Initially, all colors and clear will be quite dark if applied correctly. After 24 hours and exposure to the sun, colors and clear should look much lighter. Not for use on wooden doors. May be applied on new pressure treated wood. No wait time required. products. Its use validates the warranty on Wolmanized and Outdoor wood. The best results are obtained if wood is immersed for 3 minutes or longer. If dipping is not possible, apply by brush, roller or spray to the point of refusal. 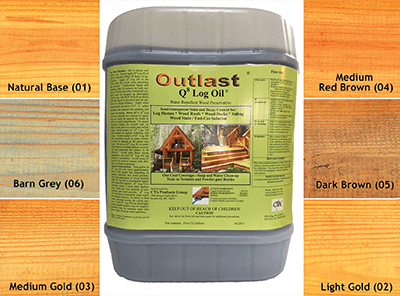 Outlast KleenStart is recommended prior to the initial application of Outlast Q8 Log Oil on bare wood. Outlast KleenStart is recommended as the cleaner used in preparation of maintenance coats of Outlast Q8 Log Oil. Q8 Log Oil must penetrate to be effective. For this to happen the log or wood surface must be porous and free of mill glaze. All mill glaze, dirt, mildew, or any previously applied film coatings must be removed prior to application of Q8 Log Oil. Avoid sanding. If sanding was required to remove a prior coating, re-open the pores of the wood with wood specific cleaner, thoroughly rinse and allow to dry as much as is possible (3-5 dry days) before application of Q8 Log Oil. Walls exposed to the full sun will dry faster. The absorption of Q8 Log Oil is directly related to the porosity of the wood, and more absorption of oil results in a better and longer lasting treatment. New, unseasoned wood will require more frequent applications than older dryer wood (especially on new decks). If you have graying, older wood, it is best to wash with Outlast Kleenstart to clean and brighten the wood before applying Q8 Log Oil. Q8 Log Oil is an EPA approved wood preservative containing petroleum distillates and metallic equivalent of copper. There is no need to apply additional wood preservative (borate form) before applying Q8 Log Oil. 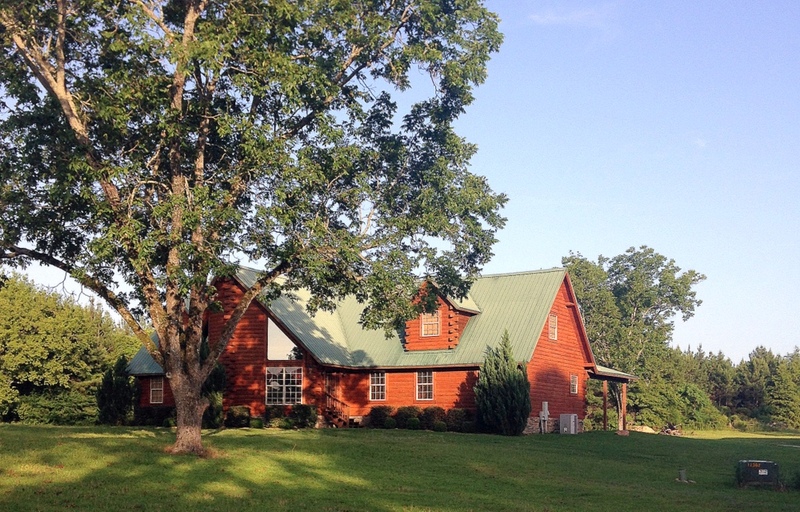 Have your logs been pre-treated with a wood preservative (borate form) at the factory or mill? Contact your log or siding provider if unsure. Wood preservatives make wood toxic to wood damaging organisms such as powder post beetles, carpenter ants and fungi. Wood preservatives do not protect against non- wood eating insects such as Carpenter Bees and other wood drilling insects; only those that do ingest wood. Click here to find out about additives available for prevention of Carpenter Bees. It is natural for wood to crack/check over time due to changing seasons, temperature and aging. Fill any spaces between the logs and upward facing cracks/checks in the wood. Fill all joints, cracks, and nail holes with a good quality acrylic latex caulk/filler created specifically for use with wood like Energy Seal or Check Mate 2. Your time frame is 2+ weeks for Q8 Log Oil to cure: Caulk after applying Q8 Log Oil to wood. This allows the wood preservative function of Q8 Log Oil to soak into all the checks, cracks and grooves in the wood to better preserve your home. Please note: Curing and full color appearance takes approximately 2 weeks. Outlast Q8 Log Oil goes on dark and lightens significantly as it cures. Curing time for Q8 Log Oil is always subject to the temperature, weather, and porosity of the wood. If there are many warm, dry days, Q8 Log Oil will cure in as little as two weeks. If there is humid or wet weather with lower temperatures in can take up to 4 weeks or more for Q8 Log Oil to cure properly. Your time frame is less than 2 weeks for Q8 Log Oil to cure: Caulking must be done before applying Q8 Log Oil to wood. Applying caulking before applying Q8 Log Oil when you have a short project time frame will ensure proper adhesion of caulking to the wood surface. We always recommended performing a 1 coat color test to a clean, dry, bare area of the structure to which you are planning on applying Outlast Q8 Log Oil. Please Note: Q8 Log Oil is difficult to remove once it has been applied. Before doing a full application make sure that your color selection is correct, has a look you want, and a maintenance schedule you can manage. Wait 24 hours after applying a Q8 Log Oil sample, to make sure you are getting an accurate representation of color. Q8 Log Oil contains an adequate level of mildewcide for most applications. 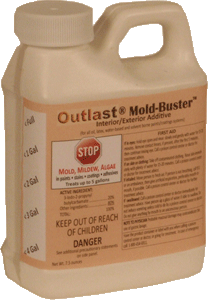 LogFinish.com recommends adding MoldBuster Mildewcide to Q8 Log Oil for homes in very humid areas. We also recommend adding Moldbuster for homes located adjacent to rivers, streams or lakes as well as in forested locations where there is little sun or in hollows with little sun and poor air circulation. Q8 Log Oil protects against wood eating insects like powder post beetles and termites. Q8 Log Oil does not protect against wood drilling insects like Carpenter Bee’s or Drilling Wasps. If these insects are an issue where your structure is located, LogFinish.com recommends adding NBS 30, an insect repellent with plant-based ingredients to your Q8 Log Oil application. 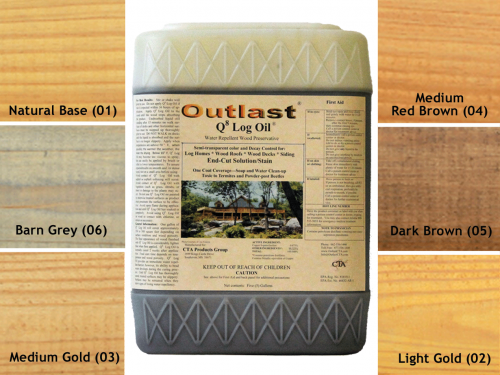 Outlast Q8 Log Oil is a one coat application to the point of saturation on clean, dry, bare wood. Do not apply multiple coats or apply 1 coat that is not saturating. This will result in severely decreased durability of the product. Do not use an airless sprayer to apply Q8 Log Oil. Airless sprayers atomize Q8 Log Oil and makes it difficult to get the saturating coat needed to maintain product durability. Only use pump up garden-type sprayers with plastic, non-corrosive tips to apply Q8 Log Oil; no brass tips. Q8 Log Oil can also be applied by using a good quality staining brush for oil based stains. Do not over apply Outlast Q8 Log Oil to horizontal walking surfaces. Mop up any unabsorbed material after 15 minutes. Treated surfaces can be slippery initially; avoid heavy traffic until the product has cured. Do not spray Outlast Q8 Log Oil on asphalt shingles and driveways because it will soften on contact. safety precautions on the label carefully before opening the container. For wood already coated with Q8 Log Oil, apply one saturating maintenance coat. Please see the Outlast Q8 Log Oil Maintenance section for more details. Below 50 degrees, Q8 Log Oil becomes too thick to pump through a pump sprayer and will require a hand brushing application. Buy sufficient product for the whole job. Blend containers with different batch numbers before starting to insure uniform color. Stir thoroughly before and periodically during application. A drill with a paint mixing attachment is best for making sure Q8 Log Oil is thoroughly mixed. 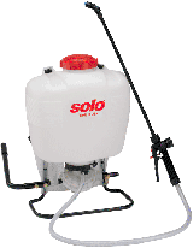 Apply between 50° F (10° C) – 90° F (32° C) by brush, pump up sprayer or roller. Do not apply if rain, snow, heavy dew or temperatures below 40° F (4° C) are expected within 36 hours. If brushing is the preferred method, use a natural bristle staining brush for oil based stains. If applying by pump up sprayer, back- brush immediately to ensure penetration and to avoid an uneven finish. Apply as much Q8 Log Oil as the wood will absorb. Coat all end grains and the back of all boards/ half log siding, if possible, to reduce checking/cracking. Clean tools with dish detergent and warm water or mineral spirits. Inspect logs for any upward facing checks/cracks that can hold water. After filling checks/cracks, perform an annual maintenance cleaning with Outlast KleenStart to clean off the accumulation of dirt and pollen. Check for wood that looks dried out, shows color changes, or fading of Outlast Q8 Log Oil. A general estimate for re-application with Outlast Q8 Log Oil is as follows: Apply first maintenance coat within 2-3 years of initial application, after that every 3-5 years as necessary. Note that walls with more exposure may need more frequent application than those not regularly exposed to the elements. Maintenance coats of Q8 Log Oil should always be applied in one coat to the point of saturation. Please see Q8 Log Oil application for directions on how to apply. Do stir well before using and periodically throughout application. Do combine containers with different batch/lot numbers before applying to insure color uniformity. Do back- brush if you are using a pump sprayer to apply Q8 Log Oil. Do apply to clean, dry bare wood. Don’t apply over surfaces previously coated with a film forming product. It must be completely removed. Don’t apply when raining or dew or frost is present or expected within 36 hours. Don’t thin with mineral spirits or other paint/stain thinners. Q8 Log Oil must be shipped via ground transportation due to its chemical formulation. All orders are shipped via FedEx. Q8 Log Oil is VOC compliant in all 50 states. great looking finish . highly recommend for log cabin,and other outside natural wood finishes !